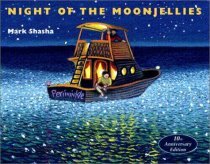 Mark's grandmother takes him on a suprise moonlight boat ride and shares a magical time in this classic story. "Night of the Moonjellies" is an autobiographical narrative about a young boy and the summer he spent helping in the kitchen of his grandmother's restaurant on the New England shore. It's a summer of discovery for young Mark, as he explores the beach each morning before going to help his grandmother and relatives sell crab cakes, lobster rolls, hot dogs, hamburgers, fries, ice cream and other favorites. One of the beautiful things about this book is the special relationship he has with his grandmother and the precious time they spend together. Mark works hard to help out, never complaining, and his efforts are rewarded by a special treat that his grandmother has planned for them after work. We learned about this book through Five In a Row by Jane C. Lambert , a fun literature-based theme unit book for homeschooling younger children. There are many layers to "Night of the Moonjellies"- from Shasha's colorful, detailed illustrations, to the energy and excitement of running a seaside hot dog stand at the peak of summer. Then there is the magical time Mark and Gram share after work, going on a boat ride in the moonlight. "Night of the Moonjellies" reminds us that there is much to share with our children and grandchildren, and hearkens back to a simpler time when part of being a kid was sharing experiences with your elders and learning to enjoy life with them. ""Night of the Moonjellies" is recommended for kids 8 and under to read to, and 6 and up to read alone.